If you’re one of the billion plus Instagram users, you’re on the right platform to grow your business and increase sales and conversions. However, don’t be surprised if you’re struggling to grow your followers and gain traction, even if you’re following all the right ‘steps’. You are in the same boat as most Instagram users. High-quality images, carefully planned and crafted Stories, beautiful text overlays… it’s all part of the recipe for the kind of content Instagram users love. But it’s not enough without the main ingredient – engagement. Instagram is all about engagement, more engagement, and that’s right – more engagement. So, I know what your next question is going to be. How do you create content that’s engaging? One way is by looking at what’s working for other brands and influencers and following a similar blueprint. How can you go wrong doing what’s already working, right? In this article, I’m looking at some of the most popular, most liked, and most engaging posts on Instagram to help you better understand what’s really working – and how you can replicate their success. Disclaimer – The majority of the most liked posts on Instagram are from celebrities, public figures, and wacky attempts to set the record for the most liked post, which is a picture of an egg! For the purpose of this article, I’m only looking at business-related content as that’s where the marketing value is and what you’re interested in. National Geographic – A picture of a Bedouin man leading camels past Al-Khazneh. Posted on November 20th, 2018, this picture already has more than 530k likes. It’s a simple picture, yet it captured something that has touched so many people. Looking through the comments most people are either impressed with the image of Petra, the famous archaeological site in Jordan, or it reminds them of when they visited the location. The takeaways from this picture is that simple works. It’s about capturing something that resonates with viewers, and in particular, your own audience in your industry. Relevance and listening to your own audience and delivering the types of content they want is one of the keys to finding engagement on Instagram. National Geographic did a great job of capturing exactly that with this image. It’ll come as no surprise that Starbucks is one of the largest brands on Instagram, and there is a lot we can all learn by following them and how they market their products. Pictures of their coffees regularly get a couple of thousand likes per post, but this zodiac chart posted in February has already had almost 500k likes. Because it appeals to a broader range of consumers than a single product does. There are 12 drinks, each aligned with a star sign, meaning there is something for everyone! The takeaway here is that posting something outside of routine content featuring your products might be the key to success. 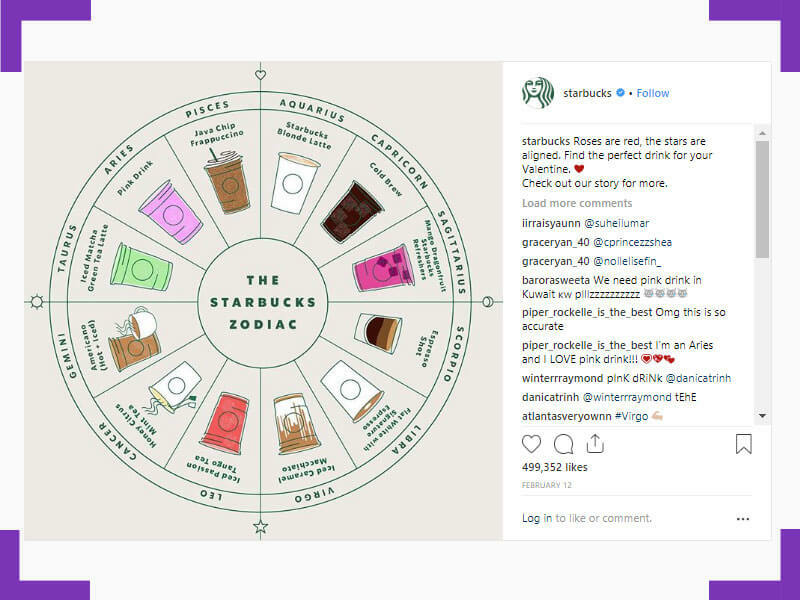 You can put together a roundup post, a summary, a list post, or why not ‘borrow’ Starbucks idea and create your own zodiac showcasing your own products? 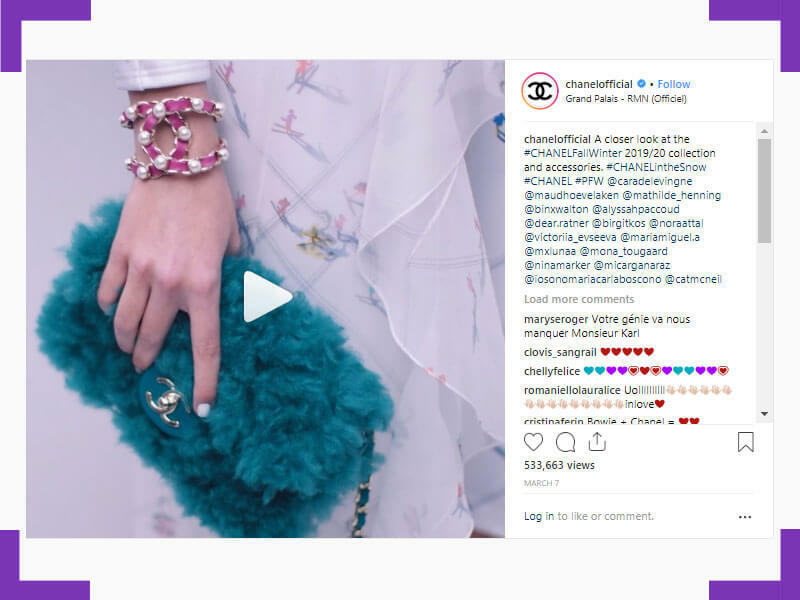 If you’re in the fashion niche you should be taking pointers from Chanel (33.7 million followers). Their content feed is a mix of product images, fashion images with models wearing or using their products, and Stories bringing their products to life. This Storie is less than a month old and has already had more than 500k views. Just think what that number of targeted viewers browsing products could do for your business…. The takeaway from this post is that Stories work. I’ve covered Stories from numerous angles in the blog if you’re not already producing Stories today is the time to start. 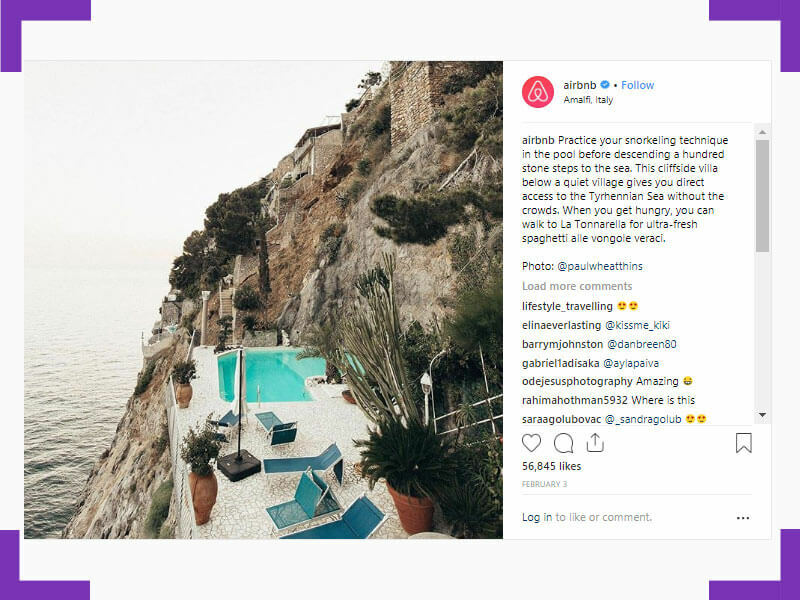 Airbnb find themselves in the fortunate position of being in the travel niche, so they have loads of awesome travel content which is huge on Instagram, and also being in the accommodation niche. So, viewers go to Airbnb’s Instagram page to find inspiration for somewhere to visit and stay, as well as just browsing interesting and unique photos from around the world. Which is why they have more than 4 million followers, which is a huge number even by travel brand standards. Some of their most liked content, such as the image featured above, is their most unique places to visit and stay. Instagram users love sharing unique and shocking photos. Just look at the pool and lounge chairs next to a huge drop-off cliff face. Admit it, this is one of the best travel images you’ve seen in a while isn’t it? The takeaway here, think outside of the box. Find something very different to the norm to post on your account, different stands out from the crowd. 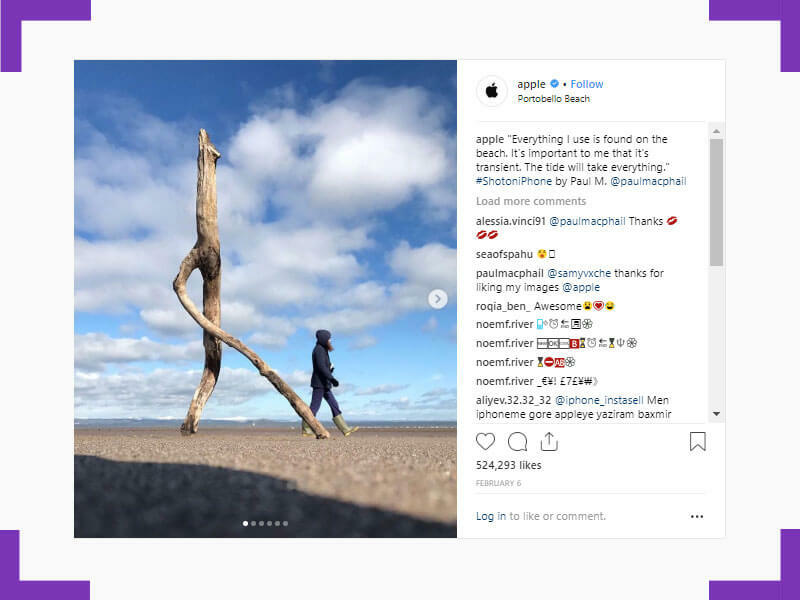 Apple has more than 13 million followers, and the interesting thing about their feed is that it’s not full of images of iPhones and their other products – it’s used to showcase photos their customers have taken with their iPhones. User-generated content is one of the most effective and engaging forms of content on Instagram, and Apple is reminding us why they are always on the cutting edge of trends and internet marketing with this move. 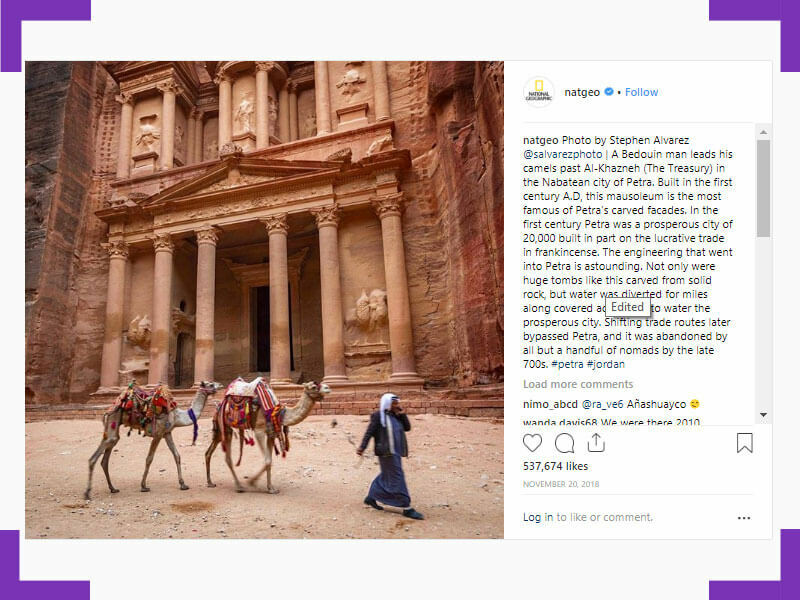 If you’re invested in learning about the most effective types of Instagram content you’ll be well aware of how important user-generated content is, so take note of how the largest tech company in the world are doing things and follow suit. Regardless of what industry or niche you’re in, there are plenty of lessons and takeaways to take note of from the above content and brands crushing it on Instagram. 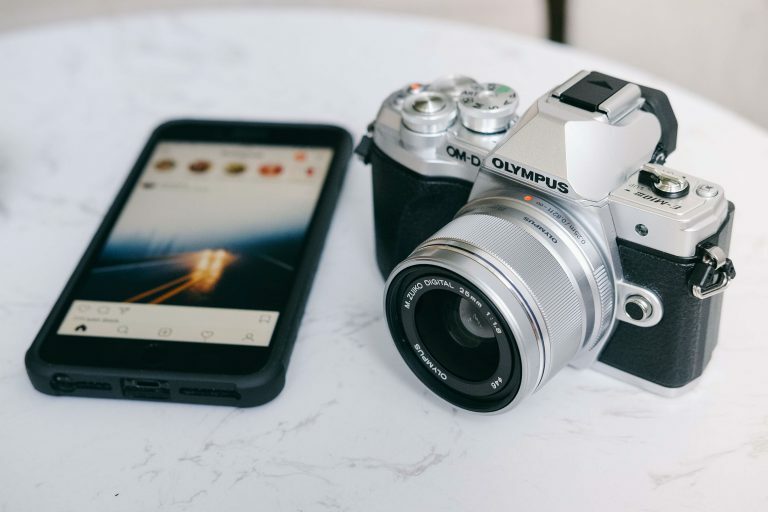 What these examples also prove is that there is so much variation and room for creativity when creating content for Instagram, which is one of the reasons why it’s growing at such an astronomical rate – you’re really only limited by your own imagination.